Check "The Latest" for frequent updates on the sewage plant. Could it be the proposed SEWAGE plant? The Creedmoor City Commissioners are determined to build an unnecessary sewage plant instead of making the financially and environmentally responsible choice to become a member of SGWASA. The City Commissioners have not readily shared information. Planning sessions for the plant were held behind closed doors. No public invited. The proposed sewage plant is not needed. Totally unnecessary. The proposed sewage plant will financially harm the citizens of Creedmoor, Butner, and all users of the South Granville Water and Sewer Authority (SGWASA). The proposed sewage plant will cause irreparable environmental harm to southern Granville County and the Tar River. 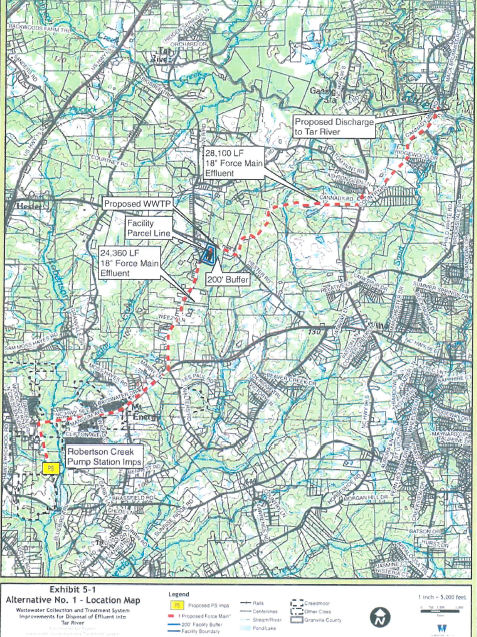 The proposed sewage plant and connecting sewage lines run for ten miles across farms and through the backyards of numerous southern Granville County residents who are not fully familiar with the proposed Hester Road sewage plant, nor have they received direct individual notification from the City of Creedmoor. The map below (click on to enlarge) shows the placement of the sewage plant, and the sewage lines that cross~10 miles of southern Granville county.